Gothenburg airport transfer - Book your transfer to and from Landvetter airport (GOT) by bus. It's quite nice to have a pre-arranged transfer for landing and departure from the Gothenburg Airport (Landvetter GOT). Below we inform about airport transfer that you can book in advance and avoid having to stand in line and have everything made in advance. Save time and headaches. The cheapast way to get to and from the airport is by bus that take to Goteborg city center. If you want to come directly to your booked hotel or apartment the best is to take a taxi. You have different bus companies to choose from to travel between Landvetter Airport and Gothenburg Central Station or the Nils Ericsson Terminal, as it is also called. It's always good to pre-order your tickets, then you just go outside the arrivals terminal if you are going from Landvetter Airport to Gothenburg and wait for the bus. Since Landvetter Airport is relatively small, it is only to go outside the terminal and you will see where the buses depart. Bus companies that run between Landvetter Airport and Gothenburg include: Flygbussarna / Airport coaches, FlixBus and Nettbus.. The bus stops at different stops between the airport and Gothenburg. 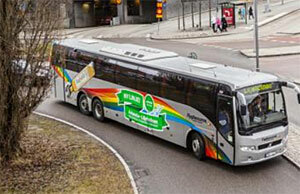 Nettbuss runs directly between Landvetter Airport and Nils Ericson Terminal / Gothenburg Central Station. FlixBus runs directly between Landvetter Airport and Nils Ericson Terminal / Gothenburg Central Station. If you want to come straight to the Gothenburg Central Station (Nils Ericson Terminal), Nettbuss and FlixBus are cheap alternatives to airport transfers. But For example, if you have booked a hotel near Liseberg, it is better to go with Flygbussarna / Airport coaches as they stop at the Korsvägen stop, just beside Liseberg and Gothia Towers..
Travel time: approx 30 min. You pay a fixed price for travel between Landvetter Airport (GOT) and the Nils Ericson Terminal in central Gothenburg. You can choose to get off along the route if the bus stops before the N E Terminal.. Onboard, you usually have free Wi-Fi and the ability to charge your mobile phone. Via the booking link below you can search for the best price with Flygbussarna / Airport Coaches, FlixBus and Nettbuss. 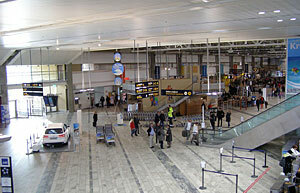 Gothenburg-Landvetter Airport is Sweden's second largest international airport and is a little bit outside Gothenburg. The Airport opened October 3, 1977, and replaced the old airport which was in Torslanda. It was Sweden's King Carl XVI Gustaf who inaugurated the airport. In the 1980s, beside the airport an parking garage was built and the domestic hall got an own airport terminal. An hotel outside the airport was built in 1987, Landvetter Airport Hotel. The new international terminal was opened in February 2013. The hall also includes several shops and restaurants.